Dragon Face is a member of the Purple Dragons. 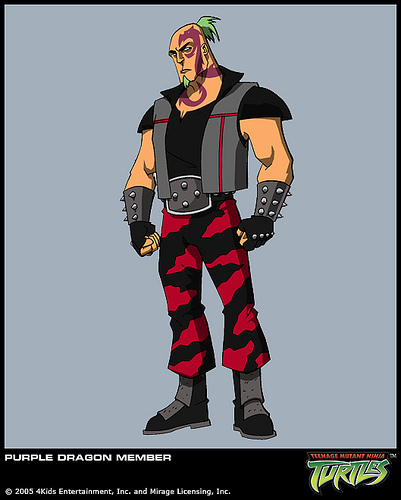 Dragon Face was the acting leader of the Purple Dragons after the death of their previous leader in the series’ first episode. He hasn’t been seen sinceCity at War when he attempted to turn the dragons against their leader, Hun. Dragon Face would return in the episode Bad Day though that was only an illusion. He has a small cameo in the Fast Forward episode Clash of the Turtle Titans in the story Mikey is telling. Dragon Face is a boss in the 2003 video game. Despite being a human boss, he is not playable in versus mode. Dragon Face makes a cameo appearance in Tales of the TMNT Volume 2 Issue #67, as Shadow is telling her schoolmates of the adventures of her father and uncles. 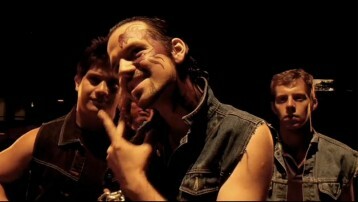 Dragon Face appears as the main antagonist in the 2011 fan film, Casey Jones. He is portrayed by Brian Villalobos.